The debate is only beginning regarding recharging electric vehicles in condo buildings. On the one side is the condo board and the owners. They do not want to subsidize individual owners who want to charge their electric vehicles nightly. Even though they live in the building and they are willing to pay for their usage. Then there are the various government agencies who are promoting clean vehicles and electric vehicles. Of course there are also the auto companies who want to sell more of these vehicles. For example any obstacle is a potential deterrent to increased sales. They are very concerned about resolving these issues. Some cities are just beginning to add charging stations for electric only vehicles. A recent article in a local newspaper reported on this particular issue. In our opinion was skewed on one side of the discussion. Hence this is what really prompted us to add our comments to the argument or discussion about who pays for the electricity in a condo. Or for that matter in an apartment building were the electrical costs are shared by all of the owners. 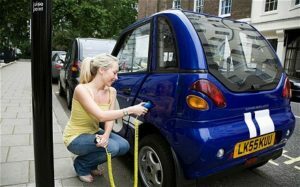 Recharging Electric Vehicles – What are the Issues? Perception is that all owners would be subsidizing the few electric vehicle owners in the building who use electricity to charge their cars. For example this is easily countered by the car owner paying for the electricity based on a measured or calculated value. People do not understand how electricity is priced and used and how much it actually costs. This is also easily demonstrated by an expert who can demonstrate what the real costs are. Governments not addressing recharging issues. We have gas stations all over the place. We have electric systems all over the place. What we do not have is a way to deliver electricity to electric vehicles. It is very difficult to address this issue. Could we put a meter on the car that calculates how much electricity is really used? An issue that the newspaper article ignored all together was the electrical infrastructure. In the example in the newspaper, the condo building is 40 years old. It has one outlet in the garage. Which one of the owners was using to plug in his electric vehicle. What do you do when there are 2 or 3 more vehicles? One outlet on one circuit will not support more than two cars and may not support more than one car depending on the amperage rating of that circuit. Who will pay for the upgrade to the condo’s electric wiring system? This can become a very expensive issue. It should be shared or paid for the owners of the electric vehicles? A condo built 40 years ago will have an electrical distribution system suitable for that time. This was before flat screen TV’s in every room, computers for each resident. As well as various other electronics, a variety of appliances that did not exist at the time etc. As a result the electrical load now may be taxing the system to the point were you have to spend major money. For example upgrading the electrical panel, the distribution system in the building. Perhaps even the entry cables into the building. Some people might say that we are just fear mongering and against electric vehicles. This is not the case at all. In fact we would like to purchase an electric car in the future when the prices are a bit more reasonable. The condo board would actually be remiss in its duties if they just allowed this owner to connect his car to the electric grid. We think that the condo board should place a temporary band on the connection and recharging of electric cars. They should arrange for an assessment of what is needed. In addition also what the impact would be of connecting one car up to perhaps a maximum of 10 cars to the system in the condo. This would include upgrade costs as well as electricity usage costs. Armed with this information, they would then be in a position to decide on the best course of action for all owners. Your opinions and thoughts on this subject would be useful to our readers. We are willing to even approve links to your own web site in return for a well written comment. Hence it should contribute to this issue and hopefully long term resolution of what to do about connecting electric vehicles to a common electric grid for recharging. charging electric vehicles is going to be a big problem in condos and town houses. i do not want to pay for their charging or for upgrading the electrical system. They need to pay for these upgrades and what they use in power !